The Vergers Voice: Where did the VGEC Seal come from? Where did the VGEC Seal come from? 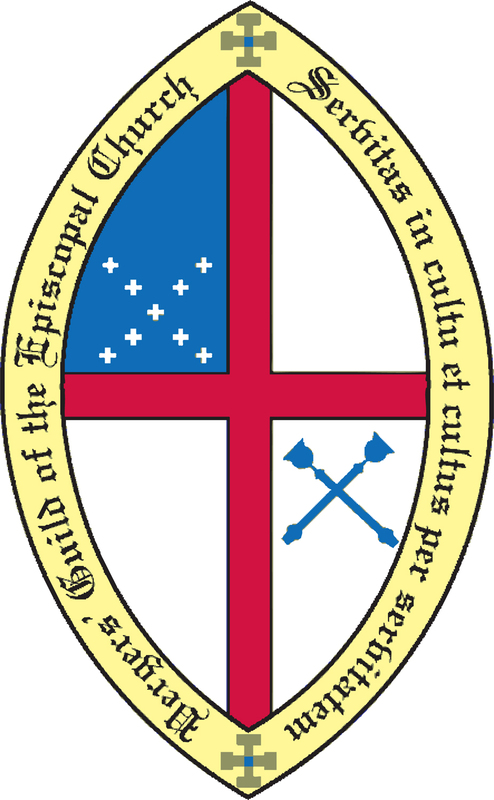 On November 30, 1989, a fledgling organization for Episcopal vergers in the United States met in its “Organizational Full Membership Meeting“ at St. George’s Episcopal Church in Nashville, Tennessee. One important agenda item addressed selecting a design and finalizing requirements for the Guild’s official seal. A year earlier in his Advent 1988 Newsletter, Bill Gleason solicited design input from the membership for a VGEC seal. 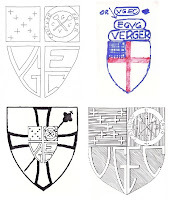 He suggested that the best design elements of the seals of the Church of England Guild of Vergers (CEGV) and the Episcopal Church might be used as a starting place. How would the final design be chosen? 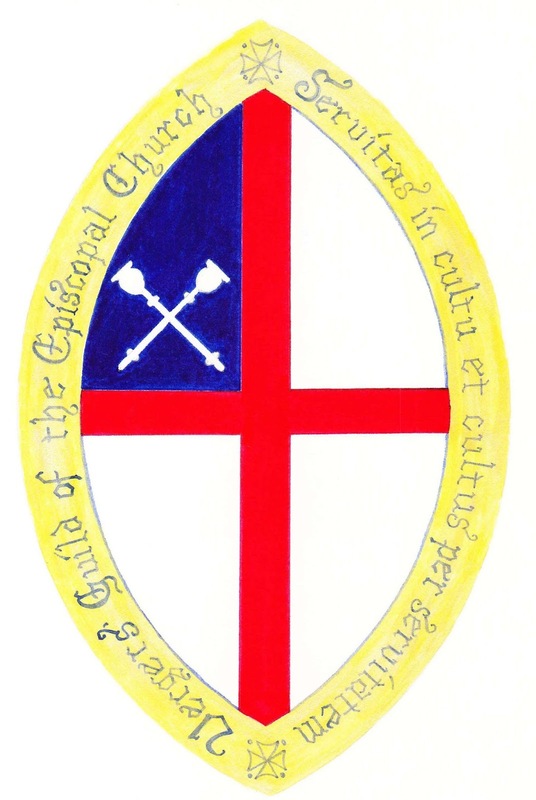 What design elements would mark our Episcopal identity? More than one creative mind started working. Design prototypes were submitted from across the country by Ford E. Smith, Raleigh K. Rollason, George L. Bland Jr., and two designs came from Scott M. Weir. 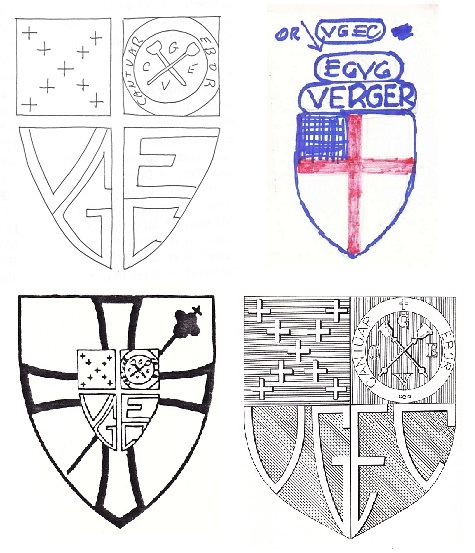 Their early documents are available in archives.vergers.org. How did we get the final design? In the late 1980’s Scott Weir was invited to be a Ceremonial Verger by Kent Wingerson of Grace Cathedral in Topeka, KS. Scott accepted and began training. A short time later, Kent told Scott that the formative verger’s guild needed a communications committee chairman. 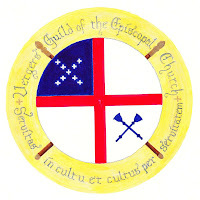 Scott thought that he lacked the time to do justice to the committee, but did volunteer to design a prototype seal for the guild. His artistic eye and spiritual inspiration became manifest in his concepts for the seal, depicted in watercolor illustrations. “I don't remember all the designs submitted, but I think that there were maybe four final designs put up to a vote. To the best of my recollection, I submitted two of those four. The two I submitted were: 1) A round seal in which I had incorporated the Episcopal Church Seal along with the CEGV crossed virges; and 2) the seal that was adopted, which was placed in a "vessica" which has a lengthy mystical history upon which I could give a short to medium length lecture. Some questioned the "crossed toilet plungers" I borrowed from our British counterparts. Those maces are symbolic now. Let's just say that a vessica is the intersection of two circles. Anyway, the vessica is often used as the shape for the seal of a bishop or a cathedral. For a bishop, it is a convenient design, housing an heraldic shield in the lower half and a mitre in the upper half." “I remember that I was personally fonder of the circular design because the white crosslets and virges essentially filled their respective quarters - but the vessica won out, and I'm still sinfully proud that one of my designs was selected. “Another specification was that the VGEC Seal should incorporate the Guild's Motto, which was non-existent. I submitted two or three of my own, along with suggestions from other members. I think I even cajoled Kent into coming up with a couple of candidates. The one that won was the Latin translation of "Service in worship, and worship through service." I had three years of Latin in junior high and high school, but had forgotten most of it. I had not, however, forgotten my high school Latin instructor, Mr. Norman Meisner - a Roman Catholic of German descent. I gave him a call, and he gave me the translation and then asked why I wanted it - when I explained about the VGEC, he said, 'Why don't you just get it over with and become a Catholic?' I always loved that guy for his candor." The minutes of the November 1989 meeting report (in part) that Mr. Karl Bailey Johnstone, acting for the Chairman, Mr. Scott Weir who was unable to attend the Conference, presented two drawings of the proposed seal for the Guild. Mr. Johnstone reported that the Committee had decided upon using the oblong design, but with the elements as included in the circular design. Mr. Robert L. Baxter, seconded by Mr. Johnstone, made the motion that the seal as presented be accepted with the following additional notation: 1) That the crossed maces and initials "CEGV" be placed in the lower right quadrangle of the seal. 2) That the name be placed around the edge of the design from the six o'clock position to the twelve o'clock position, and the Guild's motto be placed around the edge of the design from the twelve o'clock position to the six o'clock position. The motion carried unanimously. Bill Gleason remembers why the CEGV initials mentioned in the minutes were omitted in the final design, "We thought the crossed Virges (maces) which came right off the CEGV seal represented a significant and sufficient tribute to our heritage, so the initials CEGV were not really needed." So the result of this spiritually creative effort is our seal, prompted by our founders, proposed in detail by creative vergers across the country, made real with skilled craftsmanship and proudly worn today by hundreds of vergers of the Episcopal Church. See archives.vergers.org for historic documents used in the preparation of this report. What's New in the Vergers Document Library?